Identification: Females are larger than males. 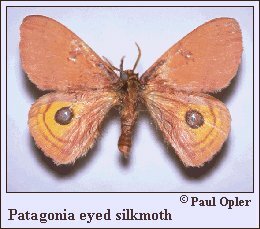 Upperside is orange to brownish orange, with an occasional yellow male; female forewing is darker than hindwing. Forewing of both sexes has faint postmedian lines; hindwing has a small white, gray, and black eyespot. Wing Span: 2 1/4 - 2 3/4 inches (5.8 - 7 cm). Life History: Young caterpillars feed in groups and older caterpillars feed alone. Cocoons are spun at the base of the host plant and have a slit through which the adult can emerge. Flight: One brood from July-August. Caterpillar Hosts: Bermuda grass (Cynodon dactylon) and bluegrass (Poa species). Habitat: Grassy areas in oak woodlands at elevations of 4400-5100 feet. Range: The Huachuca and Patagonia mountains of southern Arizona. Conservation: All populations should be monitored and conserved. NCGR: G2 - Imperiled globally because of rarity (6 to 20 occurrences), or because of other factors demonstrably making it very vulnerable to extinction throughout its range. (Endangered throughout its range).